Nellie: Ha! No. 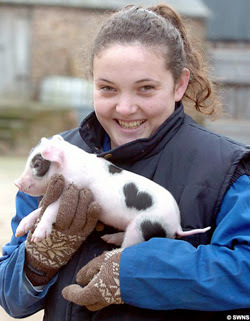 I wouldn't mind having a pet pig, though. CUTE piggy! LOL. It has hearts as spots! Cool. Ohhhhh! That is so cute! I wonder what it's name is. No. There aren't any pigs in NY...haha, just kidding. Ananka *coughkirstenmillercough* has blond hair. *giggles hysterically* Hehehehe..cuuuuute. Don't mind me, I'm bouncing on sugar rush. The poison of February 14. It's SO cute! Is that the only heart shaped spot it has? Just wondering, couldn't tell. Anonymous: That's great! Tell everyone I said hi! anonymous: OH MY GOD YOU ARE SO LUCKY!! in Islam pigs and Valentines day are not allowed. bhut i love the candy. thats so cool though, the heart spots, are they real. - the candy sales that follow it!!!!! Yes, it's true what you said anonymous. It's because they're not halal, like it's not kosher. Its a cupig! When does it grow wings? Anonymous: The cute girl in the picture is NOT me. However, I AM the author of this blog. Does that answer your question?